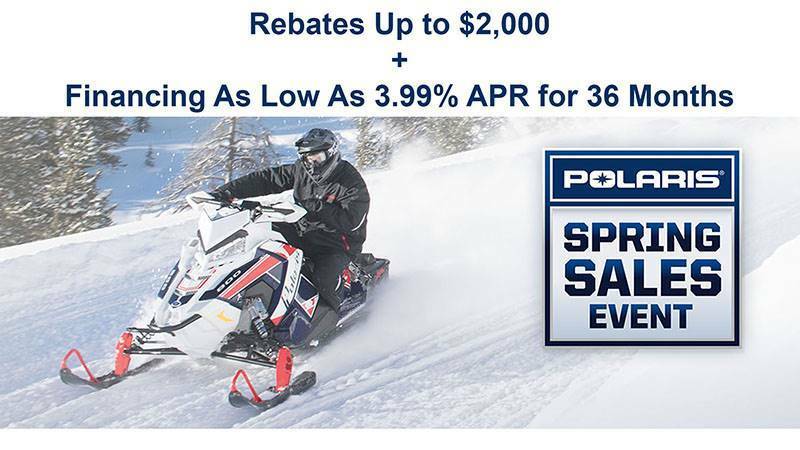 The 800 Switchback® Assault snowmobile is for aggressive, backcountry riders that demand off-trail agility and on-trail confidence. Its powerful, proven 800 H.O. Cleanfire® engine paired with the AXYS® Chassis and IGX 144 Rear Suspension deliver Rider-Balanced™ Control, Unrivaled Acceleration, and Rider Centric Comfort. AXYS® CHASSIS: The AXYS® chassis for the 144 platform is light and strong, offering rider balanced characteristics critical for the 50/50 rider. The rider is moved into a balanced position on the sled so it rides flat through the corners. When the trail gets rough or the rider jumps off into the powder, rider balance enables the rider to move back and make the front end light to climb up on top of the snow or the moguls. IGX 144 REAR SUSPENSION: A core element to the AXYS 144 platform is the IGX 144 uncoupled rear suspension, which offers the ultimate blend of durability and strength. The IGX 144 rear suspension provides RMK-inspired off-trail agility and balance with a drastically improved on-trail ride. Pitch is controlled through geometry in this rear suspension. 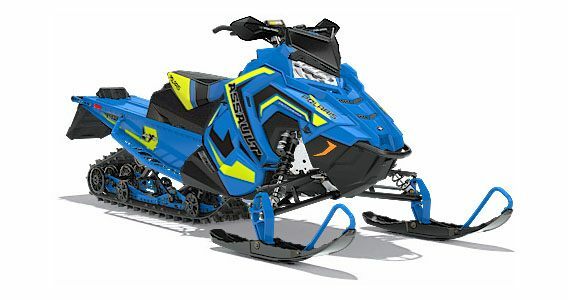 And with 43% more front torque arm travel, this sled features reduced bottoming and less drag off-trail. An optimized, lighter, reinforced tipped rail beam design gives the sled a nimble feel. POWDERTRAC™ HYBRID RUNNING BOARDS: The PowderTrac Hybrid running boards offer optimized design with 56% open space for maximum snow clean out while maintaining extreme strength. Designed to serve the needs of riders on- & off-trail. Efficient design delivers maximum strength & snow clean-out with 56% open space. Front is wide & flat for foot comfort & stability; rear has tapered, dual-angle design for mobility & snow clearance. COBRA 1.35 IN. TRACK: The Cobra 1.35 in. track delivers excellent performance on soft, loose snow off-trail. The softer lugs feature traction teeth for better grip on hard-pack surfaces. LIGHTWEIGHT: At 456 lb. the Switchback ASSAULT on the AXYS 144 platform is the industry-leading lightweight 50/50 crossover snowmobile. 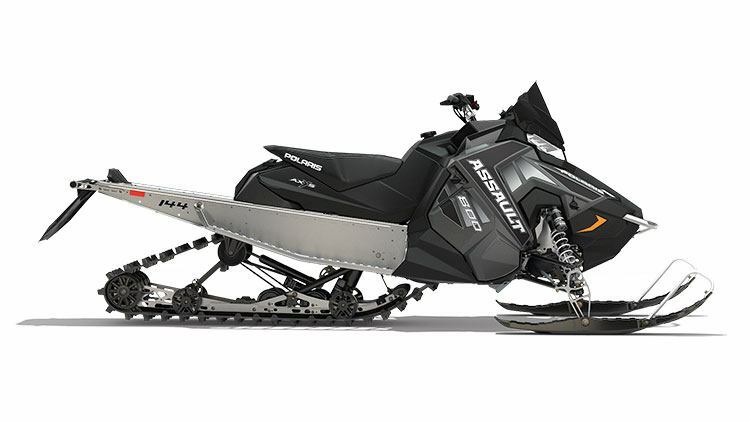 It allows you to get up on top of deep snow faster and offers quick acceleration. 800 CLEANFIRE® H.O. ENGINE: Developed in conjunction with the AXYS platform, the proven 800 Cleanfire® H.O. Engine delivers class-leading acceleration. The integrated mounting position optimizes the balance of the chassis. Featuring: 3-stage electronically-controlled exhaust valves, electronic oil pump, thermostat with bypass warms up to operating temperature 40% faster and improves durability, high-efficiency intake and exhaust, VForce reeds, lightweight crankshaft, throttle body is lighter weight and reduces throttle effort, grooved piston.